Centerstage Theatre in Federal Way opened their penultimate mainstage show of the 2017/18 season this weekend with the space travel/Rock and Roll romp known as “Return to the Forbidden Planet. Tagged as a “Jukebox Musical” the play originated as an open-air show at London’s Bubble Theatre before moving indoors. It resided for a time in the West End before arriving on our shores in September of 1991. The original work, written by Bob Carlton, is directed for Centerstage Theatre by Taylor Davis. What’s the plotline of “Return to the Forbidden Planet?” On the surface the plot is thin. It’s a love triangle held together with catchy music and cool dance moves. However, that analysis gives short shrift to the timeless themes embedded in the show. In fact, Shakespeare’s “The Tempest” told the story first, and the cast pays homage to the Bard of Avon throughout. The combination of spacecraft goofiness, soaring Shakespearean dialogue, and Rock and Roll favorites by way of American Bandstand by way of Soul Train make it a night of high entertainment! Captain Tempest (this show doesn’t suffer from excessive subtlety) mans the helm of the ship. Played by Jimmi Cook in his Centerstage Theatre debut, the Captain is frankly and openly full of himself. Mr. Cook’s task is deceivingly simple. He must swing his hair while flexing his pecs and overacting. In this case, overacting isn’t a criticism. It’s in his job description! The protracted pauses, the knowing smirk, and the double-takes to the audience all mean that Captain Tempest is in on the gags. As such, he invites the audience to play along. Jimmi Cook captains the crowd more than he pilots the ship. His performance is excellent. Olivia Lee plays the Science Officer whose name we discover about midway through. A Centerstage Theatre veteran, Ms. Lee moves about the stage with confidence. She has the best singing voice of the female members of the cast, rocking the room with her renditions of “It’s a Man’s World,” and “Tell Her.” Olivia Lee displays serious acting chops, as well as superb vocal talents. She’s one of the show standouts. While Olivia Lee takes vocal honors for the female side of things, Jonathan Fowles as Bosun takes best singer honors for the men. His part is small-ish, but when he gets a chance to sing, Mr. Fowles makes “The Shoop Shoop Song,” and “Only the Lonely” his very own. When it comes to singing voices, it is true that Ms. Lee and Mr. Fowles are the best in the cast. However, one of the things that makes this show work so well is the deep roster of vocal talent on display. Music Director Greg Smith must love coming to work on this production. The worst singer of the bunch would vie for best singer honors in many community theater productions. Kudos to Mr. Smith and Ms. Davis for the superb casting decisions they made. Kudos to the cast for performing the musical numbers at such a high level! The program for “Return to the Forbidden Planet” doesn’t mention if Helen Roundhill has teenage children, but one suspects she does. Or, she remembers her own teen years with great clarity. In the role of Miranda, Ms. Roundhill’s portrayal of “lovesick pout” are some of the show’s laugh out loud moments. Fune Tautala’s Ariel is well-drawn and even better performed. His role requires a stiff upper lip and he succeeds 95% of the time. Once Saturday night, he turned away. It was either to keep the audience from seeing him laugh or to keep from sneezing. When theater-goers see what he goes through from Captain Tempest’s flowing locks they will know why the latter may have been the case. This is the debut Centerstage Theatre show for Nick Hyett-Schnell. His Cookie (because all ship’s cooks are nicknamed thusly) is another of this show’s real talents. Who among us hasn’t longed for the heart’s desire who “friend-zoned” us? Mr. Hyett-Schnell makes us feel his longing and his loss. He’s very good in this show and will be even better in a larger role. Mark Waldstein’s Dr. Prospero and Matt Dela Cruz’ Navigational Officer were more than effective in their roles. Mr. Dela Cruz’ role was small, but he made the most of it. Mr. Waldsteins’ character changed the most (literally) from beginning to end. He has a knack for comedy and evoked some of the best laughs in the cast. “Return to the Forbidden Planet” is, without a doubt, one of the most light-hearted nights at the theater this season. The venue is lovely and the cast and crew are top-notch. Even the uncredited show narrator adds to the fun. For a good time with a great cast and the songs that turned Baby Boomers into adults, see the show! 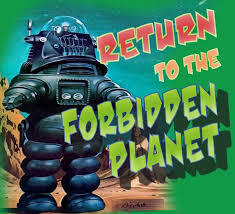 “Return to the Forbidden Planet,” by Bob Carlton, Centerstage Theatre 3200 S.W. Dash Point Rd, Federal Way 98023, Thurs-Sat. 8 pm, Sat-Sun 2 pm through March 31, Tickets: https://app.arts-people.com/index.php?show=77544 Info: http://centerstagetheatre.com or 253-661-1444.